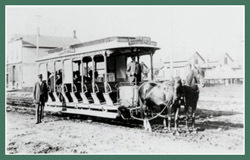 In the 1870s, a hodgepodge of horse-drawn streetcars in the downtowns, mills and factory districts of Minneapolis and St. Paul gave way to consolidated steam and then electric trolleys. As in growing cities across the country, trolleys transformed nearby farming villages into the first suburbs and created the daily commute. 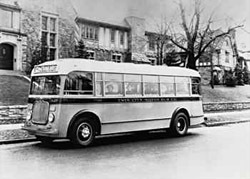 Gas-powered buses took hold after the technological proving grounds of World War I, bringing about a quick shift in demand and infrastructure. Locally, when streetcars peaked in 1920, they provided 220 million rides per year—more than four times the number of rides that Metro Transit bus service provides today to a population nearly three times as large. The Twin Cities metro had one of the most advanced transit systems in the world. 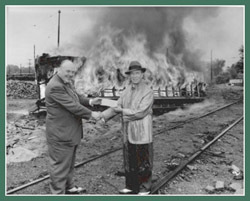 Thirty years later, streetcars in the Twin Cities were on their way out. Transportation planning for the growing region had acceded to the allure of the automobile and the operational efficiencies of bus service. Today, the region is faced not only with another generation of major growth but also with exurban sprawl. Compared with their forebears in the parkway generation, people caught in the snarls of the contemporary rush hour are less apt to associate car commuting with freedom. In the necessary search for alternatives, transit is again on the rise (Urban Land reports in May 2004 that “virtually every major city has, or is planning, some form of urban rail or rapid bus system”). Fittingly, Hiawatha light rail will begin operations nearly 50 years to the day after the last of the Twin Cities’ extensive streetcar system was yanked out of the ground. "In 1920, the Twin Cities metro had one of the most advanced transit systems in the world." Newer PostRebuilding Lake Street's "Mall of America"